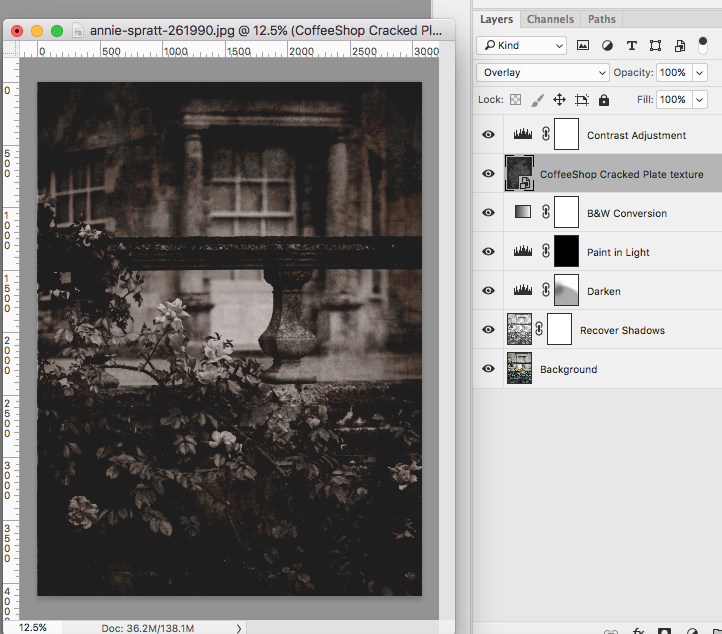 The CoffeeShop Blog: CoffeeShop "Vintage Suede B&W" Fine Art Photoshop/PSE Action and Tutorial! 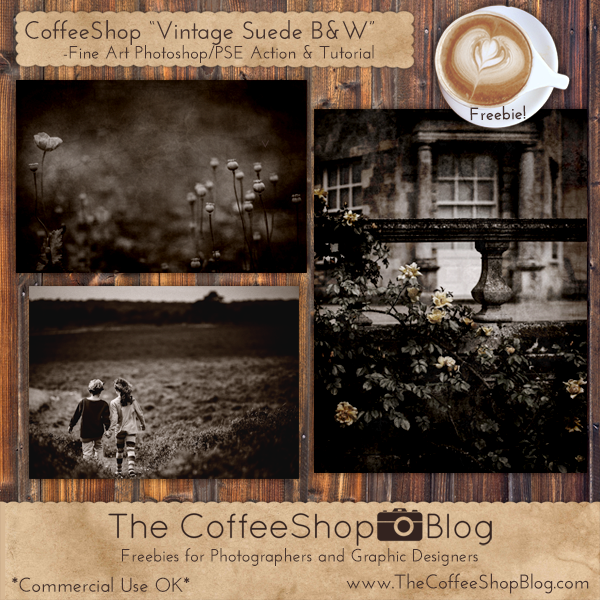 CoffeeShop "Vintage Suede B&W" Fine Art Photoshop/PSE Action and Tutorial! I am praying that all of you in the path of this storm will stay high, dry, and safe. I decided to distract myself and write a new action to share with you. 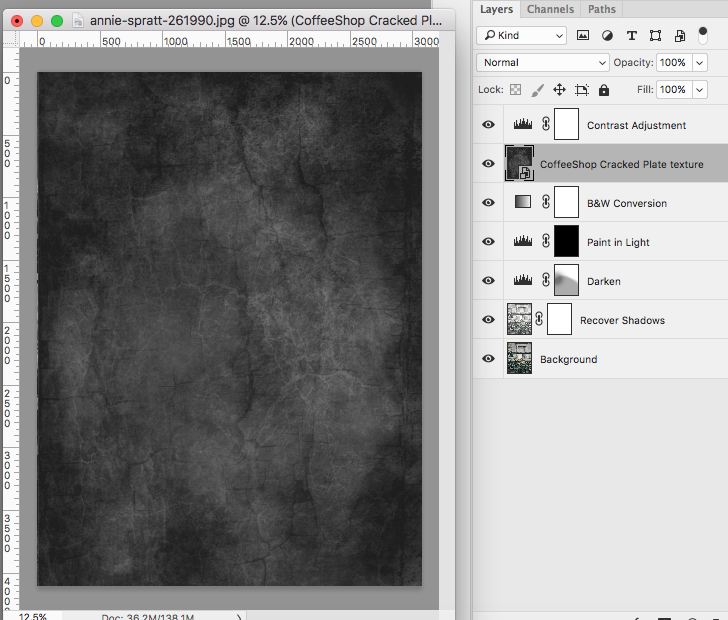 I call it "Vintage Suede B&W" an it goes perfectly with my "Cracked Glass Plate" texture I released earlier this week. Here is the action applied to a image of Duke as a little boy. Sigh, this seemed like just the other day. 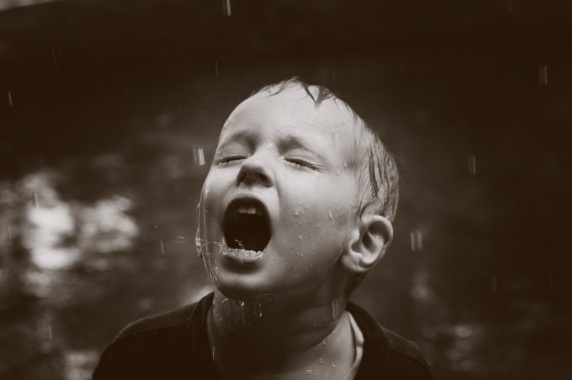 Looking at this image reminded me that their early childhood years were during a horrible Texas drought and I remember telling Paul I will never complain about rain again. Of course, I broke that promise when we first moved into this house and had 10 inches of rain over one afternoon which flooded our garage. Texas has really extreme weather. No wonder I have weather-related anxieties! OK, enough about my neuroses, on to the action tutorial! 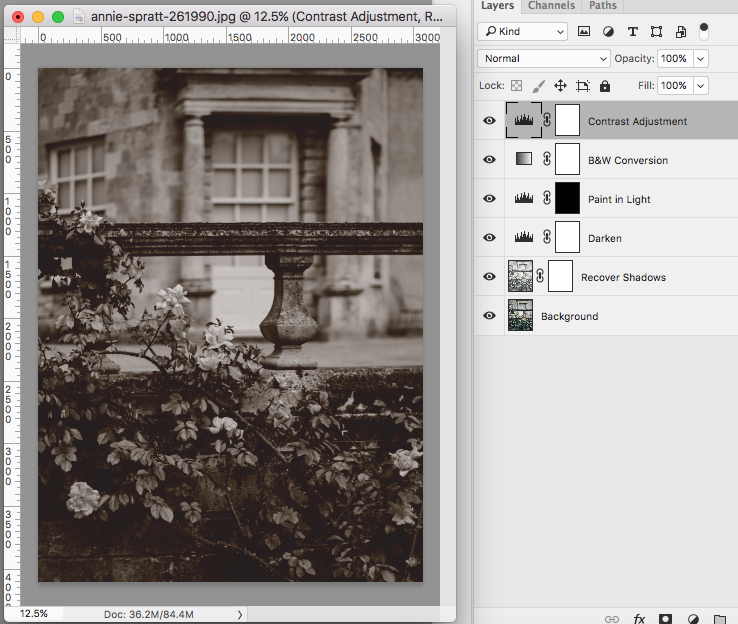 Thanks to the talented Annie Spratt at Unsplash for the images I used in this tutorial (poppy, children, roses, tattoo). 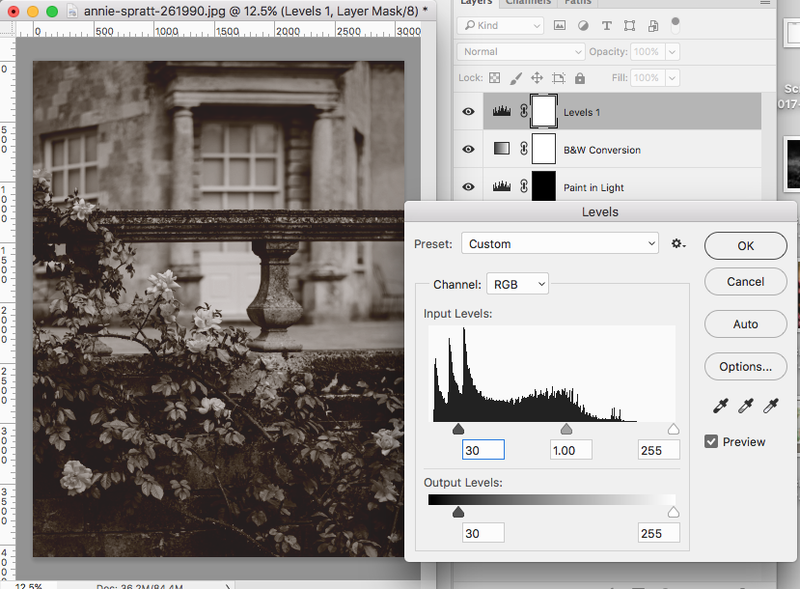 When the Levels adjustment layer comes up, adjust the contrast sliders under the curve and the left Output Levels slider. It is preset for a slight matte-effect, but you can bump up the contrast or increase the matte-effect. This is the image after the action finishes running. 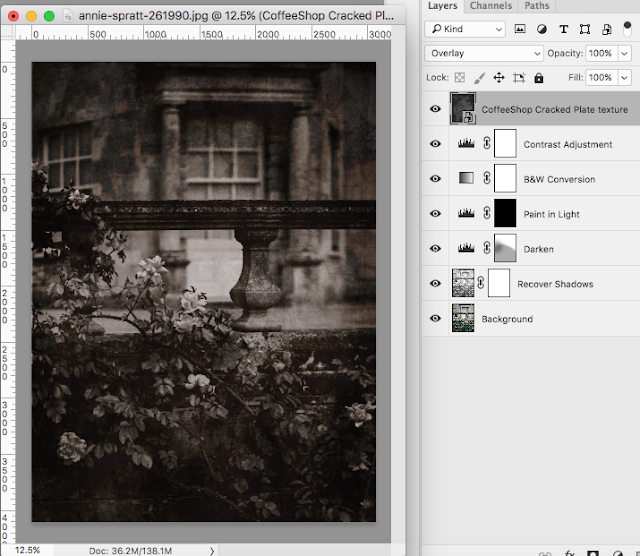 You can adjust each layer's opacity and/or paint on the layer masks. 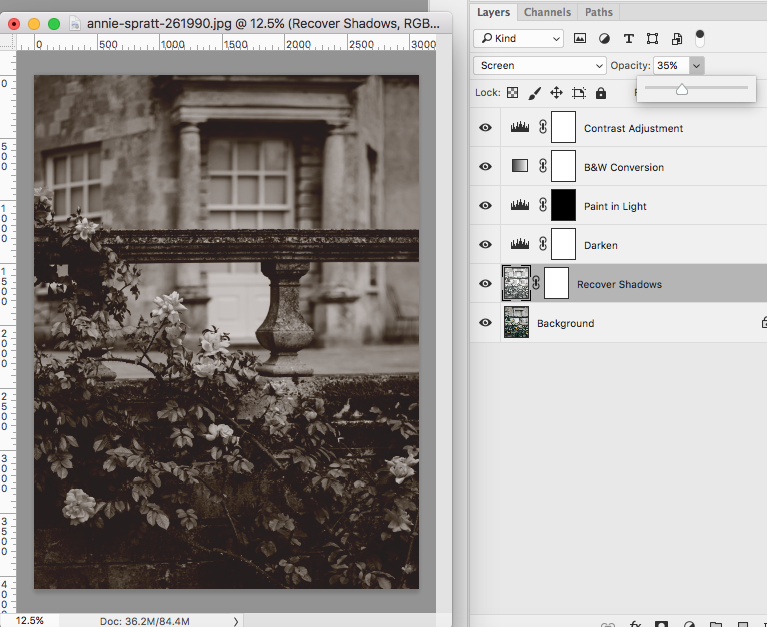 For this image I turned down the "Recover Shadows" layer to 35% opacity. 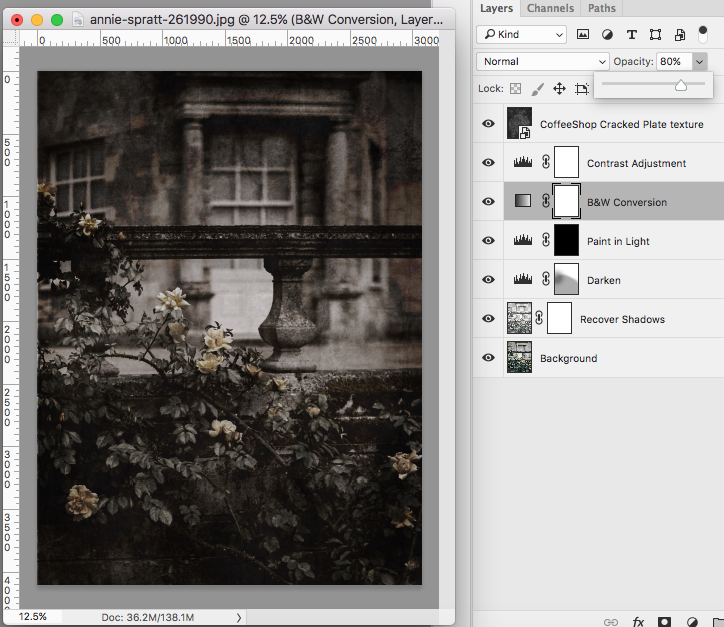 I used a low opacity black brush and selected and painted the "Darken" layer off the roses to brighten them slightly. I added my "Cracked Glass Plate" texture. You can download it here for free! 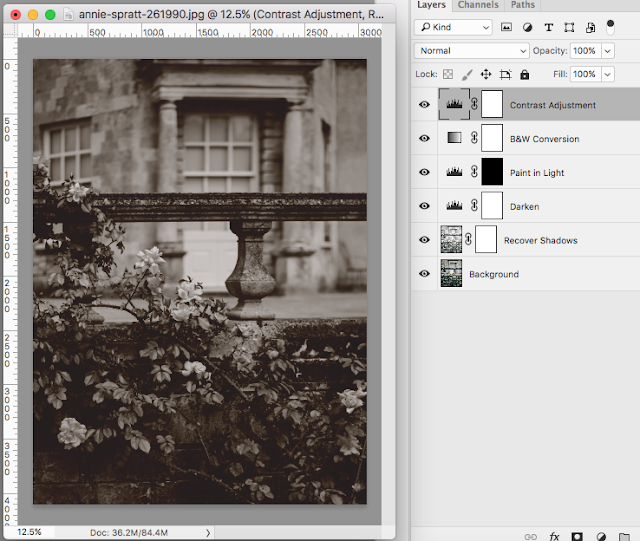 I put the texture in Overlay blending mode (try soft light, screen, multiply or a combo of these blending modes for different effects) and dragged it under the "Contrast Adjustment" layer, but over the "B&W Conversion" layer. This looks great, but I wanted to make the edit look more aged and distressed. To do this, simply drag the cracked glass overlay on the top. It really ages it. 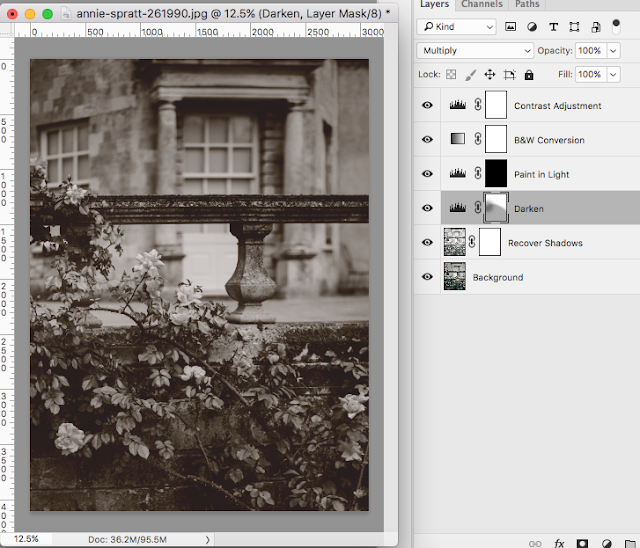 Finally, I thought it would be fun to add back a bit of color, so I turned down the "B&W Conversion" layer to 80%. I don't do this on many images, but it really worked on this one. 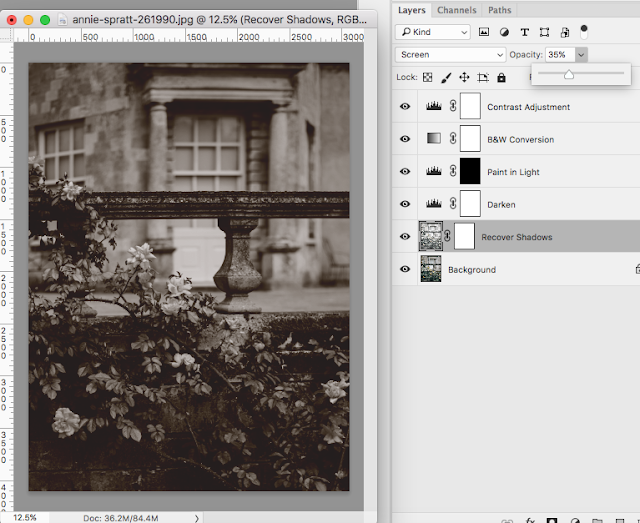 I am really happy with this edit. It is very moody, almost haunting. 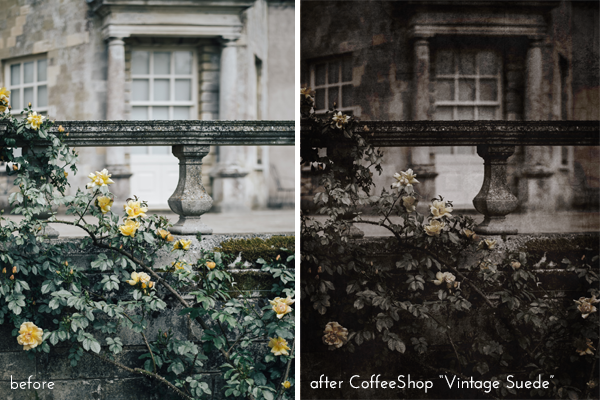 Download the CoffeeShop "Vintage Suede B&W" Photoshop/PSE Action! First off, I am so happy to hear that you and Duke are feeling much better. This cold has certainly gone on long enough. 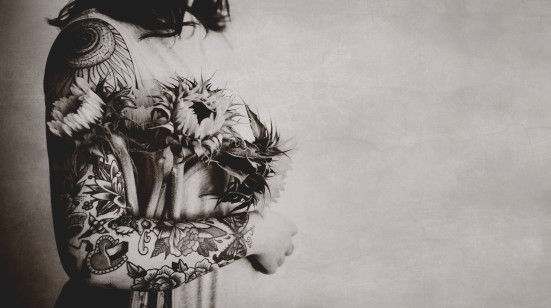 Finally, really cool effect. I love it on that pic of the woman and the pic you used in the tutorial. Really neat and especially with how you left some of the colour on the roses. Cool. Anyway, good luck my dear. I'm rooting for you guys!!! Thank you Lisa, we are finally on the mend if still weak! Paul is still sick and in the worst of it right now. This has been the most evil bug. And thank you, I am so happy you like the edits! 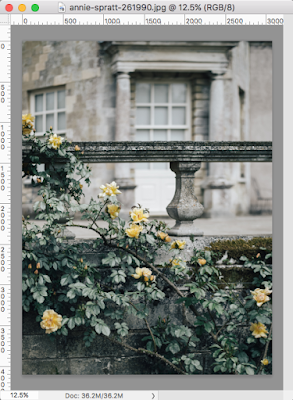 I usually don't do subtle color like that, but for some reason I feel that it really worked with that image. I'm sorry that Paul is still battling it too. Sheesh, evil bug isn't the word. I just finished reading that parts of Texas are being evacuated. I really hope you guys are north, east or west of the affected areas. Keeping my fingers crossed!